It's a huge flaw with these car the way they rust. How do the door jambs look? You could add the needed structure back in more easily if you're not worried about the underside looking factory. I did some brainstorming back then about reinforced rockers and "subframe" connectors. Structural foam also piqued my interest, but there weren't many good options. Maybe that's changed in the last 10 years. That car looks so clean that it's worth thinking about non-traditional repairs to save it. woody90gtz wrote: It's a huge flaw with these car the way they rust. How do the door jambs look? Here are some pictures I have from my old car. Mine didn't look nearly as bad until I used a screwdriver to punch through the brittle stuff. I had thought about running .120 wall square tubing as new rockers for strength, but the door jamb was so bad I decided against it. Shine a flashlight up that rot hole and see if the inner door jamb is screwed. That one goes before the visible door jamb. Rust chemicals won't cut it for anything other than surface rust...that rocker structure is already gone. The rot needs to be cut out and replaced with some kind of structure. Thanks. I dont really have the skill or the time to do this unfortunately, so I'm just going to try this to slow it down and have it fixed when I have the time and money. I'd look into fixing the rusted brake lines ASAP. ifixalot wrote: I'd look into fixing the rusted brake lines ASAP. How hard is that and how much would that cost? It seems like something that's a pain and wont be cheap. I wanted to get the LIMG first before I do that. But I plan to do them soon. Started the LIMG today. I said to my friend helping me, "what if they were already replaced" sure enough when I popped the limg off, some shiny metal fel-pro gaskets greeted me. So this was all a waste of time, but atleast I can do a bunch of other stuff and clean everything up all pretty. As a side note, should I replace them with my doorman ones, or leave it alone and keep the fel-pro ones? That is kind of a bummer. I had a customer with a W-Body car with the same M-Code 3100, moderate oil-leak from beneath the intake where that silicone glob seals the lifter valley. I had them talked into fixing that, partially based on the concern of eventual LIMG failure, and found the same thing that you did -it sort of makes one feel like a fool. But, in my customer's case that moderate leak was still a problem -the previous repair had probably used Fel-Pro's $#!t silicone -take that tube and toss it in the trash if you use Fel-Pro gaskets... In your case, I always feel that gaskets are a one-use part, BUT these are actually intended as re-usable, so long as the rubber is still in good condition. Make sure it hasn't hardened, cracked, or deteriorated, and you COULD use them again if you want. They aren't cheap, that is for sure. I like Perma-Tex Ultra Black for this application, or the 'Right Stuff' black. Grey is for rigid-to-rigid with high clamping force, which this if not, and you could also add a film of Ultra Black to both sides of the gasket around the coolant holes. 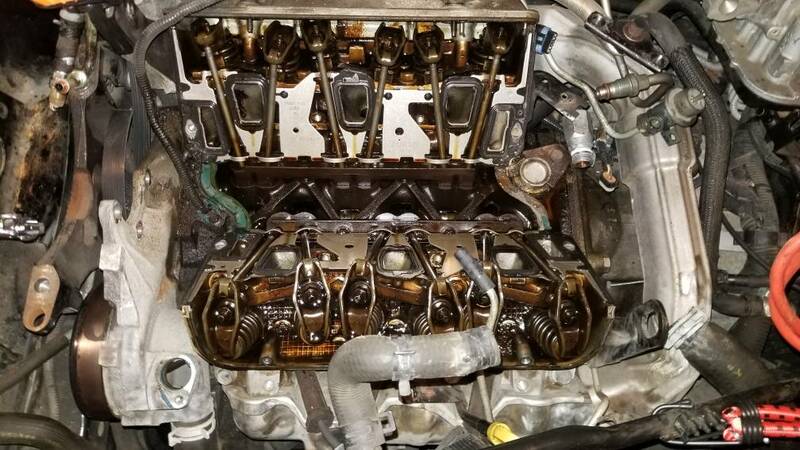 It is also good to use for the lifter-valley ends (makes me admire the Big Block Mopar engines that don't have those huge gaps that need to be gooped-up, or even coolant passages going into the intake manifolds). 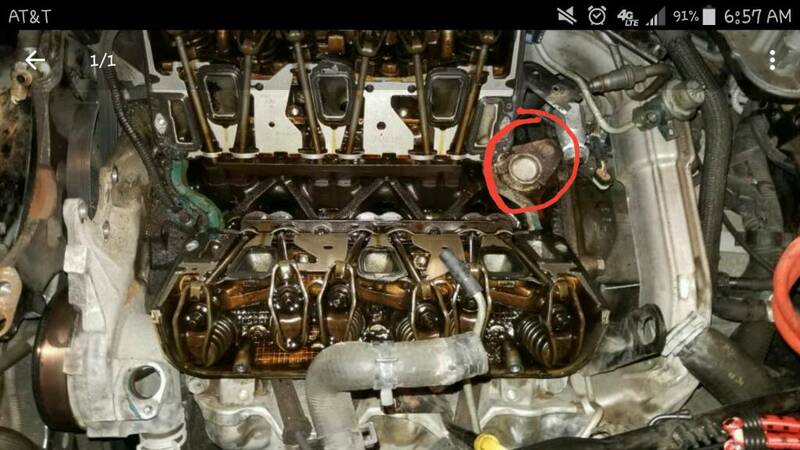 It looks like you got lucky with your coolant-pipe quick connect fitting off the back of the intake -those tend to break because GM makes them out of pot-metal. I would recommend removing that fitting from the pipe, and replacing the O-Ring inside, and make sure you re-wrap the thread of that fitting with Teflon pipe-tape, or if you prefer, coat them with Teflon pipe-thread sealant. ...And, don't forget that oil-pump drive-gear bearing, since you are this far in, the O-Ring on that should still be replaced. Brake lines can be done cheaply -you can get a 25-foot roll for $18-$20 online. Practice with some extra line, and get good making double-flares, buy or use a loan-out tool with a double-flair capability. The tubing nuts are readily available locally or online too. 3/16" is easy to hand-bend too. It takes some time, but doesn't really cost much. You CAN put in a patch-piece if you want to save some time, but you will end up with an extra connection or two (each one is a potential leak-point), and you still have to learn to flare the lines (actually pretty easy). Thanks where is the o-ring at that I should replace for the oil pump. Also I do have the black stuff for the gasket. I have new dorman gaskets and I think I'm just going to replace those while I'm in there. I'm going to do my plugs and the 2 wires I couldn't reach before too while it's easy to get to. As for the heater hose connector, I actually went out and bought a new one for the 9 bucks it was as I broke the quick connect fitting and it was easier to just replace the part. Also, any advice on getting the injectors out? They were pretty stuck in there, and should I use oil or gas or silicon or what to lube the o-rings for the injectors? Did LIMG, have a nasty oil leak after. Must not have put enough RTV on, so I need to take it all apart again. At least I now know how to do it, I just hope I dont run into any more problems along the way. The power steering pump put up quite a fight last time. I also plan to put the car up on ramps/stands on all 4 corners as my back was not happy after being bent over an engine on a low car for like 8 hours at a time. Last edited by Cam2363 on Fri Mar 22, 2019 10:50 am, edited 1 time in total. Backed the car into a guardrail today. It's bad. Took chunks of the metal out. 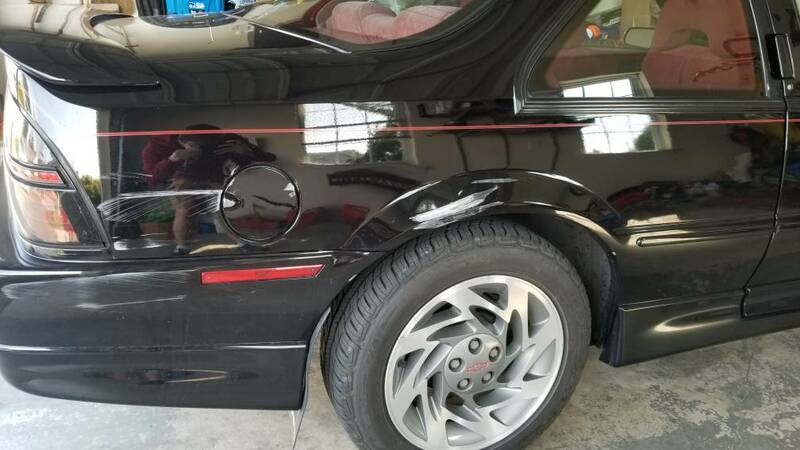 So I'm gonna have a lot of body work to do as I can't afford to pay somebody to do it. The oil leak is going to have to wait. Man, sorry to see that. The fact is, stuff like this is going to happen if the car gets driven, and if it isn't driven then it isn't really a car and isn't worth owning, IMO. So don't feel too bad... Just fix her right. If you are delayed at all on fixing the body-work, at least make sure you protect the surface from exposure. 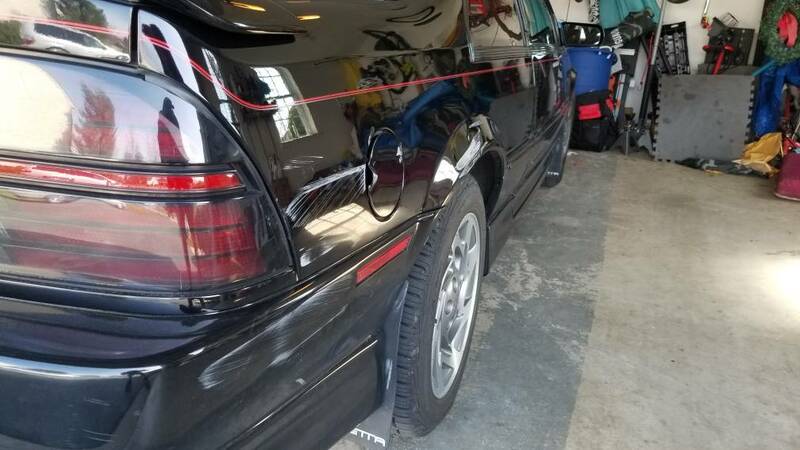 My 'old' '95 Z still has Plasti-dip removable spray-paint on the quart-panel, the paint had been burned off in an arsonists' fire some years ago. I don't see any indication of rust on my car so far, and when you do finally peel that stuff off (I may have left it on too long now, but my right quarter is also crushed in pretty badly from a previous owner's mishap, so the whole thing needs to be redone) it leaves a nice, clean surface, even takes a lot of dirt and loose paint with it too, helping to make a paintable surface available. Good luck taking care of that (still) beautiful Beretta!